If you’re in the business of marketing coffee makers or gourmet coffees, you need to hear what coffee drinkers say. Right now, thousands of coffee drinkers are participating in online conversations which arouse passions, change opinions, and influence buying decisions. Every day coffee lovers express their views and emotions about the coffees they drink and the equipment they use to brew it. Some are delighted, some are upset, some are concerned, and some just want to share their passion for all things coffee. Some coffee lovers are huge fans of single serve coffee makers. Others hate them, for a variety of reasons. Some swear by drip brewers or percolators, while others think that if you use these types of coffee makers you might as well drink instant. Some people are hugely concerned about the amount of plastics used in coffee makers, while others never give this a moment’s thought. Most people prefer to buy their coffees locally, but some buy online and have favorite coffee roasters they go back to. In other words, there are vast, ranging discussions taking place across the social web among coffee lovers. These coffee drinkers are passionate, they are engaged, and they are making buying decisions based on their discussions. And because of the growth of the social web, they are talking with each other more than ever before - through their home computers, tablets and smartphones. The What Coffee Drinkers Say report gives you a unique insight into the preferences and intentions of coffee lovers. The report is broken into 6 sections, each exploring a particular aspect of buying, brewing and enjoying gourmet coffee. Each section focuses on the marketing opportunities revealed by what coffee drinkers say. The combination of the consumer comments and marketing commentary provides you with invaluable insights you can use when planning future promotional campaigns. 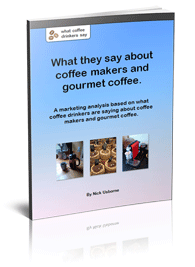 This report is valuable to any company in the business-to-consumer coffee business. Is there something in this report that can help your coffee business? Almost certainly. -	If you market single serve coffee makers or single serve coffees, you’ll want to read pretty much every page, because the future may not be quite as rosy as you think. -	If you market traditional coffee makers, read the whole report as well, because you can learn a lot from what the single-serve guys have been doing over the last 10 years. -	If you are a small to medium sized roaster, read it all, but with particular attention to pages 10, 11, 19 and 22-32. -	If you have an online coffee store, read it all, with special attention to pages 10, 11, 19 and 29-32. The only group for which this report will offer very little value is coffee shops owners. But that’s OK, because coffee shop owners already have shelves and boxes filled with reports and documents outlining marketing best practices. I can’t claim these answers will address every question you might have, but I think they address the high points. Q. Where do you get your data? Where do all your consumer comments come from? A. Good question. This information would be of limited value if it were simply collected randomly, over a limited time, and drawn from across the social web. The comments I have included in the report are, for the most part, drawn from my own web properties. My coffee websites and social media streams are visited by over 3,000 coffee lovers each and every day. And many of them leave comments. Over the course of a year, I connect with hundreds of thousands of coffee drinkers, and have been for over 9 years. My coffee-related social media pages go back over 7 years. In other words, I have been watching and participating in the conversation for a long time, listening to and replying to thousands of coffee lovers. Also, my web properties are informational, and not tied to any particular brands. This allows me to collect a broad range of opinions, outside the confines of particular brand loyalties or preferences. This has given me unique access, and a perspective that spans many different types of coffee drinkers, over a long period of time. I know which threads of conversation endure, and mean something. And I can spot the conversations that are like a flash in the pan, and hold little value for marketers. This is why the comments included in this report hold so much value when compared to a random search of coffee-related conversations spanning a just a few days, weeks or months. Q. What about the marketing commentary you say is included? Where is the value there? A. If I were simply a coffee guy, you would be right to question the value of my interpretation of what people say about coffee. But I’m not. My name is Nick Usborne and I have been a copywriter and marketing consultant for over 30 years. Over that period I have won 15 awards for my copywriting, and have worked and consulted with hundreds of companies, including AOL, The New York Times, Yahoo!, MSN, The Getty Trust, Intuit, John Deere, Reuters, Franklin Mint, Citibank, Encyclopedia Britannica, Nabob and CoffeeAndTeaWarehouse.com. In other words, I have decades of experience in marketing, and know how to recognize conversations and language that provide clues as to how best to influence the buying decisions of consumers. This is the experience I bring to the table when writing the marketing commentary for this report. Q. Which topic areas do you cover within the 6 sections of the report? A. I have included those topic areas which attract the most interest and conversation. Through the search engines and social media people ask thousands and thousands of questions about coffee each day. But many of those questions are predictable and reveal little about the searcher. Which is the best coffee maker? How much coffee should I use in proportion to water? Where can I find a good coffee grinder? These ordinary questions don’t drive conversation or arouse passions in other coffee drinkers. These are informational searches. What I focus on in the report are those conversation threads that do attract lively discussion. These are the topics people get passionate about, which they care about, and which drive choices and action. Q. What kinds of coffee buyers are represented in your report? A. For the most part they are in the early stages of their gourmet coffee journey. The coffee drinkers I follow are exploring opportunities to really start enjoying their coffee. A year or two ago some were probably buying Maxwell House or Folgers. Today they are exploring gourmet coffee, thinking about what type of coffee to buy, wondering if they should get a coffee grinder, and so on. From a marketing point of view, this is ideal. They are not fixed in their opinions. They are willing to experiment and try out different coffees, and different ways to brew them. In other words, these are your best prospects and the people you need to listen to most carefully. Understand what they want, and you are one step closer to crafting a marketing message that will attract them as customers. Q. Who is behind the publication of this report? A. This is an important question. Particularly when you suspect a report might be sponsored by a particular company or organization. In this case, the sole author, editor and publisher is me. And as you will see, I don’t favor any one manufacturer, brand of coffee roaster. At the same time, although the report is written from the perspective of a professional marketer, and based on what coffee drinkers say, this is ultimately my personal view on where the industry stands right now, and what the future holds. A full 34 pages in length, you can download this report as a PDF file to your computer right now. Priced at just $49.95, insights gained this report could significantly influence your marketing approach for the year to come. And if, after reading the report you believe it contains less than $49.95 in value, you can ask for your money back at any time within 48 days of purchase. For payment details, please contact me and mention "What Coffee Drinkers Say".